Weeknights are really busy right now. I'm coaching my son's hockey team, playing hockey, doing my best to follow a fitness plan (consistently) and splitting shifts with my wife shuttling the kids to soccer, hockey, piano and girl guides. So when I saw this Hellmann's Recipe in a magazine, and noticed how easy it looked, I had to give it try during the weeknight rush. I get a sense of accomplishment when I'm able to eat right and still make it to the kids (or my) weeknight activities on time. 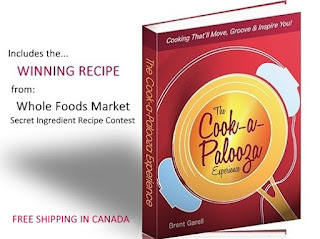 Of course to do it, you need a main course that can be made in less than 20 minutes. The Hellmann's recipe called for chicken breasts but I choose lean pork loin chops because they're a thin cut of meat and cook quickly on the grill. 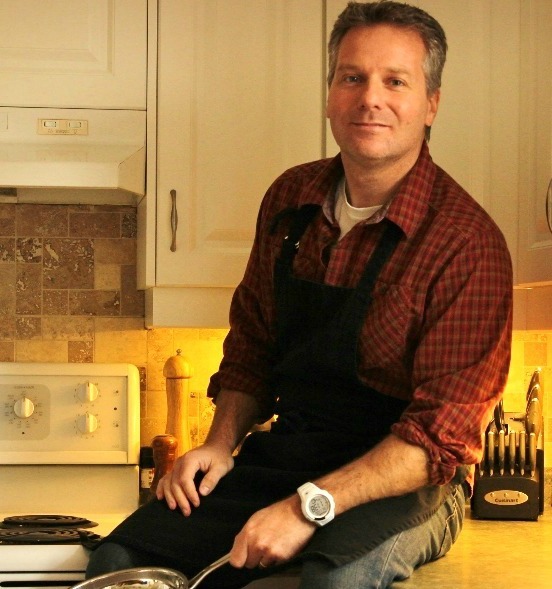 It's still warm enough in this part of Canada to keep grilling outside but soon the temperatures are going to drop. 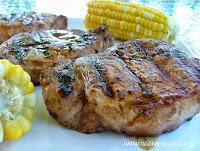 And when they do, I'll switch to cooking these pork loin chops in a skillet with oil. 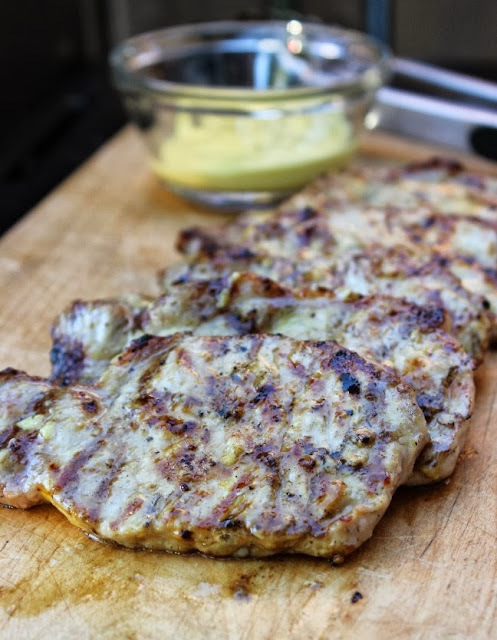 While the grill was heating up, I whisked together the honey mustard sauce. It has an amazing tangy flavor that would easily be at home as a dressing on a healthy salad. I used what I had left as a sandwich spread for my toasted pork, lettuce and tomato sandwich I ate for lunch the following day! 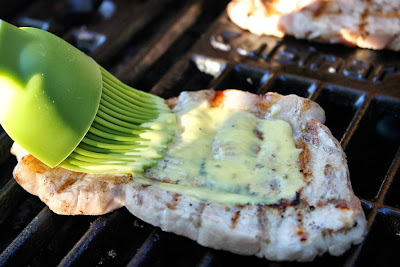 Use a third of the honey mustard sauce to brush on to the pork during the last few minutes of grilling. Save the rest as a dipping sauce. Grill 5 minutes per side over medium-high heat. Same is true if you were to cook them in a skillet with oil. While the pork was on the grill, rice was cooking on the stove-top and a bowl of frozen peas were heating up in microwave. With a bit of hustle you can pull this meal together in less than 20 minutes so you can head out the door, well fed, and show up to your [fill in the blank] on time! 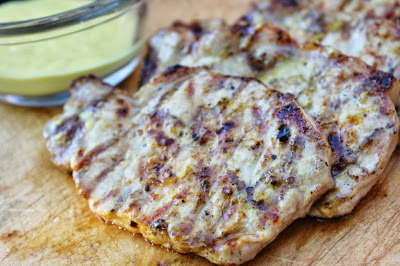 Grilled pork loin chops brushed and dipped with a sweet and tangy honey-mustard sauce. In a bowl, mix together mayonnaise, mustard, honey and vinegar. Season with a big pinch of salt and pepper. Reserve 1/3 of mixture in a bowl for dipping and keep the remaining 2/3 of mixture for brushing on pork during grilling. 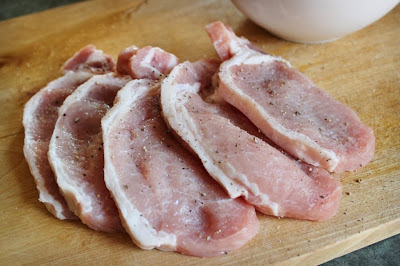 Remove excess fat from pork loin chops. Season both sides with salt and pepper. Grill pork over medium-high heat until pork is cooked through but still juicy on the inside, about 5 minutes per side. During the last 2 minutes of grilling brush on mustard mixture. 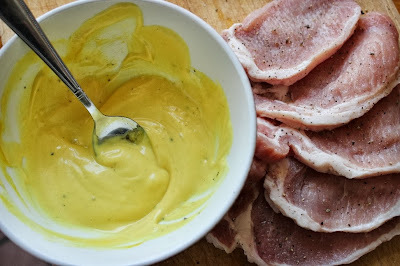 Serve pork with remaining mustard mixture for dipping. 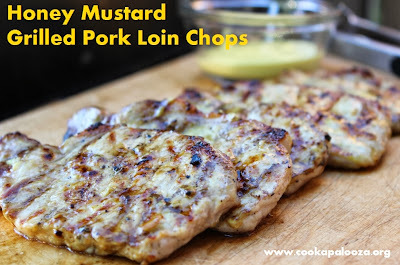 ANOTHER GRILLED PORK RECIPE YOU CAN TRY!